Take a look at an original ad from Converse and the NBA's baddest bad boy Dennis Rodman. Earlier this week we saw a Classic Commercial for NBA bad boy Latrell Sprewell and Converse. 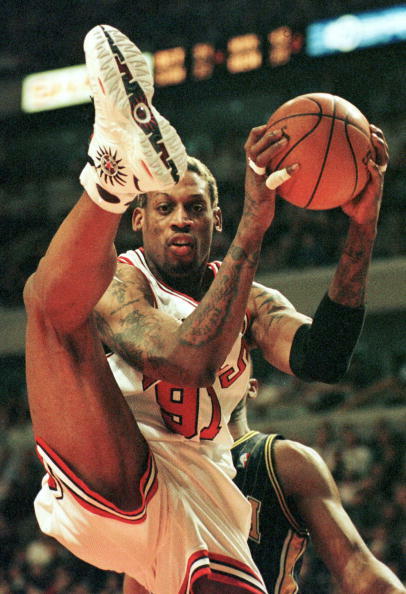 Today we'll check out an ad of the NBA's baddest boy, Dennis Rodman, and his Converse shoe. The All Star Rodman was his second signature shoe with Converse after the All Star 91. This model featured a design inspired by Dennis' tattoos and on-court flair. It's topped off with visible REACT Juice in both the heel and forefoot. Dennis wore these during the 1997-98 season on the way to his third NBA Championship with the Chicago Bulls. This ad, stretched out over the bottom of two pages, features the shoe on one side and Rodman on the other with the Converse "Stay True" slogan. This slogan refers to Converse's return to classic Chuck Taylor All-Star style on their current designs. Modern footwear that stayed true to their roots. This All Star Rodman was definitely one of the most succesful and memorable shoes from this period.